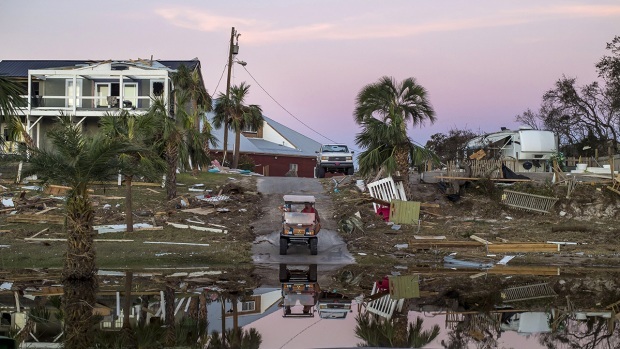 Hurricane Michael barreled into the Florida Panhandle Wednesday as a monster Category 4 storm, bringing with it damaging winds and life-threatening storm surge and rainfall. It made landfall near Mexico Beach with sustained winds of 155 mph, becoming the most powerful hurricane to ever hit the Panhandle. President Donald Trump declared a state of emergency for Florida ahead of the hurricane. Below are maps that show the storm’s predicted path and severe effects. The maps will be updated as new information becomes available. This map shows how high the storm surge from Hurricane Michael has a 1 in 10 chance of reaching, measured in feet above ground and with the tide. Click a location to see the possible storm surge height there. Data valid from Oct. 10, 7:00 a.m. EST to Oct. 14, 1:00 p.m. This map shows how much rain is expected to fall within five days.